The enemy pirate swam toward their boat, his sword cutting the waves rippling through the Potomac. For Nikki and Dave DuBois, this was a first. 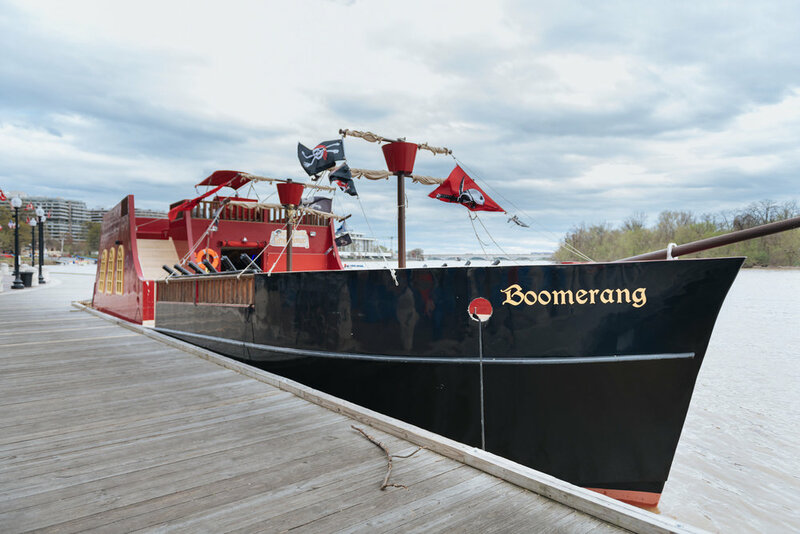 Nikki and her husband, Dave, live in Georgetown and own Boomerang Boat Tours—operating three vessels out of Georgetown’s Washington Harbour, including the family friendly pirate ship. They’d never had a man overboard, especially one clutching a costume prop. Life at sea—or river, in this case—is as unpredictable as Nikki had hoped. She spent the first eight years of her career as a high school teacher specializing in human geography, sociology, global issues, and government, but wanted a change of pace. Interested in hospitality, Nikki had the ‘crazy idea’ to buy a school bus and turn it into a fun way to transport young professionals in and out of the city to Redskins games, vineyards, crab feasts, concerts, and Shenandoah tubing trips. Thanks to Montgomery County’s liberal leave policy, Nikki took a year off unpaid. If she crashed and burned, she’d still have her job. After buying a used school bus, Nikki and Dave painted the outside, gutted the inside, and added surround sound, decorations, and stability poles. Six months later, a second bus was added to meet demand. Dave was also spending so much time helping Nikki that his own work in financial services was taking a backseat. Two years in—despite protests from both sets of parents who thought they were crazy—he quit his job and joined Boomerang full-time. By 2010, they were operating six buses and a limo—leading a majority of tours themselves. Eventually they wanted more, and saw a niche in the market that had yet to be filled. They flirted with the idea of expanding from buses to boats for two years, expecting a door to slam in their face at any moment. Nikki says it was an intimidating process—from working with the Coast Guard to getting a liquor license, finding and fixing up a boat that could fit their vision, locating a staging area, and hiring captains and DJs—yet Boomerang Boat Tours successfully set sail in 2012. 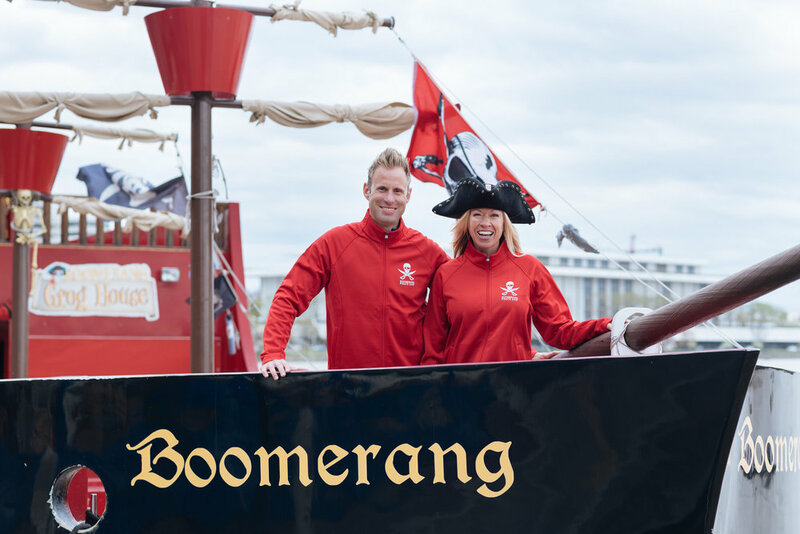 Now in their seventh season, the company offers pirate ship cruises for kids and adults, as well as an adult party yacht, and a smaller party boat for privately chartered cruises. The bus and boat businesses overlapped for two years before they decided to sell their bus fleet—Nikki too often bartending on a cruise while simultaneously calling a tow truck for a broken-down bus or helping a lost driver. The water seems to suit her and Dave better, anyway. Both of them grew up spending time on their fathers’ small speedboats—Nikki at the Jersey shore, and Dave fishing in Lake Michigan. Living in Georgetown, they often spent date nights cruising on the Nightingale’s sightseeing boats, drinking cheap Coronas and chatting with the crew. Now they share that same camaraderie with their own guests. The business is foolproof in that way. No matter what, it’s always someone’s birthday. Soon, it will be their son’s. Nikki and Dave’s 10-month-old has forced the couple to divide and conquer their time on the boats. They used to work together frequently, and met many customers on the buses and boats who became their best friends. But with Calvin in tow, their future is looking less party and more pirate. Nikki says they’re all aboard.